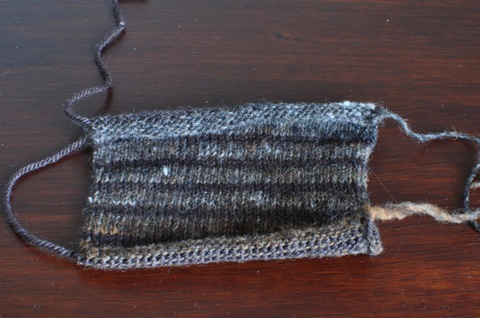 While deliberating on the fate of my Kalajoki socks, I started on another pair of knee socks. This year seems to be the year for making socks for myself, something I’ve never done before. It’s also perfect weather for knee socks; Autumn is barely a blip of a memory now as the very chilly days have begun. As I walk to the tram stop each workday, I think about how good it’ll be to have some knee socks to provide an extra layer of protection against the cold. The pattern used for these socks is Laura Chau’s Delicious Knee Socks. It’s a good pattern, this one. While the sock itself is a fairly basic toe up, there are lots of foot width/foot length/calf width/leg length combinations which makes it very adaptable. Getting a start on these socks has meant finally using some Noro Kureyon Sock I was given for my birthday a couple of years ago. Finding a good brown to stripe with the Noro proved to be quite a challenge, however Sweetgeorgia yarns came through with the goods with their Tough Love Sock in the espresso colourway. The swatch provided some concern as there wasn’t quite enough contrast between the Sweetgeorgia and the Noro for my liking. As it turns out, I swatched with probably the darkest part of the colourway; the lighter parts look really good against the chocolatey brown. 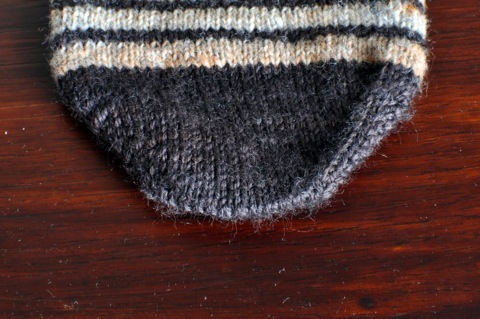 With the lighter colours around it, the darker sections, which didn’t look so great in the swatch, look fine in the sock. Yes, it seems the cool weather has arrived earl and intends to stay. 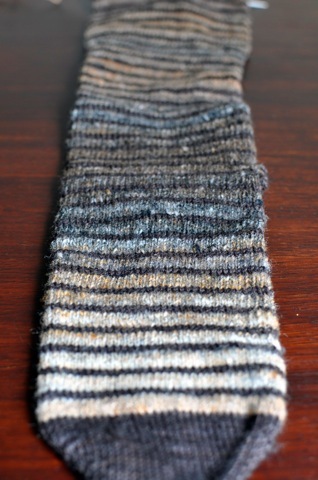 Kne socks sounds like a great idea to me and what a good way you have found to extend the Noro. I am a fan of browns so Espresso would have my vote. it is indeed the year of the knee sock! i hope i get mine finished before the year is out, thats for sure. this looks just amazing! what a great colour combo. and that tee pattern is just lovely! do it do it do it!! Your socks are looking beautiful and after the cold weather we have been having you definitely need them!